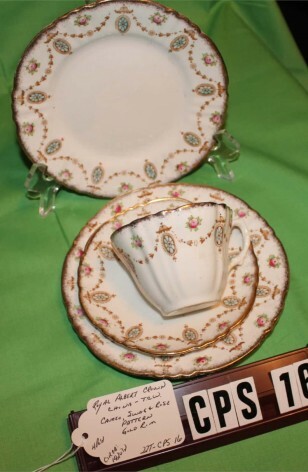 Antique - Royal Albert Crown China Trio/Quad Tea Setting by T.C. Wild - Un-named Pattern #4294 - Art Deco period of the 1920's - Includes Four Pieces. This Antique Royal Albert Crown China Trio/Quad Tea Setting in Pattern #4294, being made in the Art Deco Period of the 1920's, comes with a Lovely Blue Cameo Hung on a Swag of Bells, having Pink Roses above the Swags. Items are Scalloped and Fluted with Beautiful 22kt Gold Hand Painted Rims. This Pattern also is on the inside of the Cup, Great Condition. This Antique Royal Albert Crown China Trio/Quad Tea Setting in Pattern #4294, being made in the Art Deco Period of the 1920's, comes with a Lovely Blue Cameo Hung on a Swag of Bells, having Pink Roses above the Swags. Items are Scalloped and Fluted with Beautiful 22kt Gold Hand Painted Rims. This Pattern also is on the inside of the Cup, Very Good Resale Condition unless noted below or in pictures.